The Hall of Fame Isn’t Far for Roberto Alomar. Ten Gold Gloves (deservedly), two World Series rings, 474 stolen bases, and 12 All-Star games make up Roberto Alomar’s Hall of Fame resume. Alomar, along with Bert Blyleven, should easily make it baseball’s shrine on this ballot. 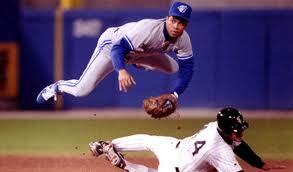 When people speak about Roberto Alomar, the phrase "greatest second baseman in history" is often times uttered. Famers. Ryne Sandberg, Joe Morgan, Bill Mazeroski, Frankie Frisch, Charlie Gehringer, and Bobby Doerr are all Hall of Fame second basemen, keeping this Hall of Fame second baseman company. Alomar spent most of his career with the Toronto Blue Jays (5 whole years) and won two World Series rings with Cito Gaston’s Blue Jays. And he was a stud in the Jays title drive. He hit .320 /.380/.471 during it. Alomar took home the ALCS MVP in 1992. In 1993, during the Jays second title drive, it was a similar story, but no MVP award. After the 1995 season, Alomar signed with the Baltimore Orioles, and he did not miss a beat. He put up almost identical numbers, and proved to be one of the best top of the order hitters around. Though he didn’t run as much in Baltimore as he did in Toronto (his Baltimore high stolen base total was 17, which would have been his low in Toronto), he did find more power. 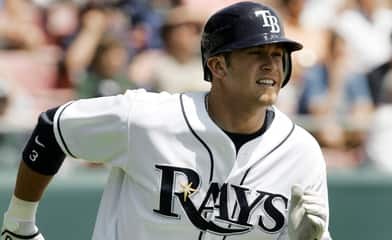 He clouted an at the time career high 22 home runs and 43 doubles. As productive as Alomar was in Baltimore, his first season there was not without its controversy. After arguing with an umpire over a third strike call, Alomar hurled his saliva in the face of umpire John Hirschbeck. Naturally he was thrown out of the game, and fined. But, luckily for Alomar and Ty Cobb, being a nice person is not a requirement for enshrinement, despite how much some voters try to tell you it is. After Alomar was done with Baltimore in 1998, he went to Cleveland, to play with older brother Sandy Alomar. This was actually the second time the two would play on the same team. They both played on the 1988 and 1989 Padres team. He put up great numbers in every aspect of the game, and his first year in Cleveland, he hammered a new career high in home runs. 24. Through his time with Toronto, Baltimore and Cleveland, Alomar was racking up the awards. 12 straight All-Star games, 10 Gold Gloves, and 4 Silver Sluggers. He was as disiplined at the plate as they come. He never struck out more than 96 times, and he walked more than he struck out seven times. It’s hard to keep Alomar out of the Hall of Fame. The only question is what insignia will he have on his cap? My guess is Toronto. .247/.321/.377. No, that isn’t Nick Punto’s triple slash stat line. It’s close. 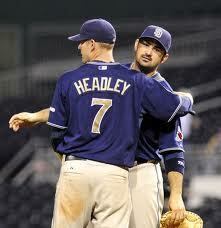 But, that is the collective offensive output of the first place (for now) San Diego Padres. They don’t hit, and have a team total of 110 home runs, 27 of which belong to Adrian Gonzalez. They are a bad offensive club in every sense of the word. All they can really do is steal a base, but, you do have to get on base to do that. So, how are they in first place (for now)? Remember last offseason when when the Seattle Mariners said they were building around pitching? It didn’t work. San Diego hits just enough to have the “pitching and defense” mantra work for them. The Friars are easily the best defensive club in baseball, with an MLB-leading UZR of 47.3 (bringing up the caboose? The Indians. -47.3). With an ARM rating of -1.0, which while under the league average isn’t terrible, the Padres catch damn near everything. Who’s anchoring the outfield? 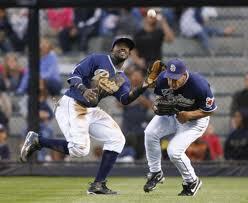 Tony Gwynn Jr.
Tony Gwynn Jr. He is leading that outfield, having saved 13.1 runs with his range, and 2 runs with his lack of errors. He is leading that outfield, having saved 13.1 runs with his range, and 2 runs with his lack of errors. Gwynn, also has one of the weaker arms in the starting outfield, posting a -0.8 ARM. But, he is a centerfielder, and he does get to the balls he needs to, and he’s just under league average in ARM. He is, without a doubt, the leader of the San Diego outfield. He is to the outfield, what Chase Headley is to the infield. Headley, combined with the man at the other corner at PETCO, Adrian Gonzlaez, are needed with San Diego's extreme groundball starting pitchers. posted a 14.4 UZR, or an 18.8 UZR/150. Headley is literally twice the defender that Kevin Kouzmanoff was at any time during his tenure with the Padres. Sure, Headley can hit. His 10 home runs, a .272 average, and a .336 OBP attest to that, but defense truly is his bread and butter. Headley, combined with the man at the other corner at PETCO, Adrian Gonzlaez, is needed with San Diego’s extreme groundball starting pitchers. San Diego has used 8 starting pitchers this season, and only 2 of them have a GB% under 40% (Chris Young and Wade LeBlanc, and Young is only a spot starter). 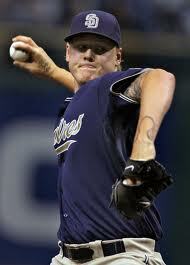 But it really is Mat Latos who stands heads and shoulders above the Padres starters. With an arsenal that includes a 94 MPH fastball and a curveball that rivals Adam Wainwright’s as one of the most amazing I’ve ever seen, Latos has held batters to a .254 BABIP. And he does a lot of it himself. A 9.25 K/9 to go along with a 2.25 ERA and a 3.05 FIP make him one of the most dominating pitchers in baseball this year. What you do hit is probably going on the ground, right to Headley or Gonzalez. And what you are getting in the air, is probably going right to Tony Gwynn Jr.
A 9.25 K/9 to go along with a 2.25 ERA and a3.05 FIP make Mat Latos one of the most dominating pitchers in baseball this year. Once you get past Latos and the rest of the starters, you have to deal with the San Diego bullpen. They’ve nicknamed themselves “The Penitentiary,” and for good reason. When they come in, the game is locked up. Joe Thatcher and Heath Bell both of a LOB% over 80%. The Pads have used 6 relievers that have struck out more than one batter per inning. And when it come to scoring off of them? Good luck! Thatcher is the proud owner of a 1.42 ERA and a 1.46 FIP. Bell sports a 1.78 and 1.90. You had better get your runs off the starter, because you sure as hell won’t be getting them off of the bullpen. And do I even need to talk about the almost anemic offense? It’s been Adrian Gonzalez. Name an offensive category, and Gonzalez is leading in it. He is the complete player, and we all know it, and there is nothing I can say about him that hasn’t already been said. If this San Diego team can shape up, and figure out what the hell has happened over the last 10 games, and get into the playoffs, with their pitching, and defense, and ability to hit just enough, they could easily be the National League Champions. Joe Thatcher and Heath Bell both of a LOB% over 80%. 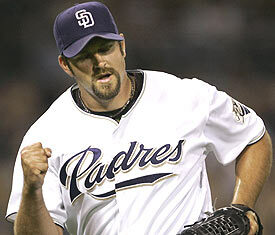 Tags: Adrian Gonzalez, Chase Headley, Heath Bell, Joe Thatcher, Mat Latos, San Diego Padres, Tony Gwynn Jr.